Aspendale Gardens is a suburb in Melbourne, Victoria, Australia, 27 km south-east of Melbourne's central business district. Its local government area is the City of Kingston. According to the 2016 census, Aspendale Gardens had a population of 6,530. The main road that goes through Aspendale Gardens is called Wells Road (State Route 23). 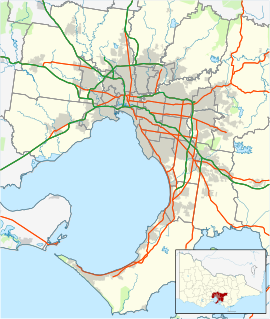 The M11 Mornington Peninsula Freeway and Spingvale Road/Edithvale Road (Route 40) also run along the border of Aspendale Gardens. In Aspendale Gardens, there are BP, 7-Eleven petrol station, a shopping centre (which includes an IGA, a Liquor Store, a Bakery, a Hairdresser, a Chemist, a noodle shop, a fish and chip shop, a pizza shop, a dentist and wellness centre, a kindergarten, a primary school (named Aspendale Gardens Primary School), a vet, a community centre, a car wash, and a retirement village named Richfield retirement village. There are many open areas and playgrounds facilities in Aspendale Gardens including an cricket oval behind Aspendale Gardens Primary School, 6 playgrounds and over 20 large grassy areas spaced throughout the housing estates. There are many walking trails throughout Aspendale Gardens, including the Long Beach Trail (from the Patterson River to the Mordialloc Pier), the Mordialloc Creek Trail (from the Waterways Trail to Mordialloc Pier), the Waterways Trail (from Wells Road to Waterways) and the Aspendale Gardens Trail (from 7 - Eleven to the Long Beach Trail outside St. Louis de Montford School). ^ a b Australian Bureau of Statistics (27 June 2017). "Aspendale Gardens (State Suburb)". 2016 Census QuickStats. Retrieved 3 December 2017. ^ "Postcode for Aspendale Gardens, Victoria". postcodes-australia.com. This page was last edited on 12 May 2018, at 06:45 (UTC).